Welcome to the 3rd (and shortest) installment of the serial release of my twice-rejected article. When we last left our heroine, she had been told she was “overly dramatic” in her scholarship about James Henry Breasted’s 1919-1920 trip to Mesopotamia. Here, we see that there have been other archaeologist operatives, and that Breasted wasn’t the first or the last. By the end of World War I, as the European sphere was concerned, the United States had a noticeably “tardy espionage system,” and Wilson was in no hurry to rectify the situation (Dorwart 1979, 123). The British Intelligence Bureau, on the other hand, had a well-developed network of trained operatives who were professional archaeologists. T. E. Lawrence, also known as Lawrence of Arabia, had begun his career as an archaeologist in 1910 at the ancient Hittite site of Carchemish under Leonard Woolley. They worked together to gather intelligence for a particularly significant site report, published by the Palestine Exploration Fund. The Wilderness of Zin (1914) was not only an important publication for archaeologists, but its detailed geography and cultural discussion made it a crucial source for British military intelligence throughout the war. 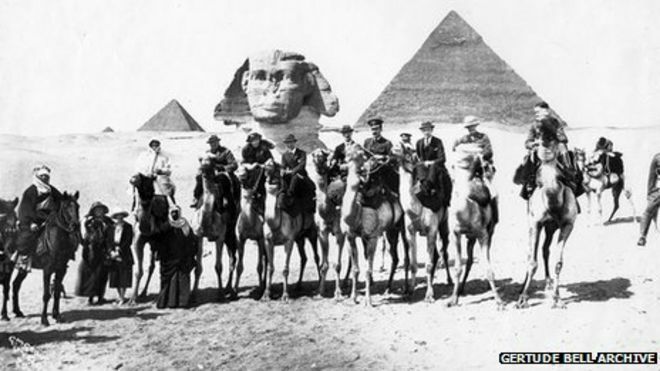 Archaeologist, traveler, and linguist Gertrude Bell was also well-known and highly sought after by intelligence officers from the start of the Great War, due to her extensive travelling and expertise in the ethnology of Arab tribes, languages, and customs. Intelligence officer and Oxford archaeologist David Hogarth wrote to her in early 1915, requesting her to “help prepare detailed information on the location, numbers and lineage of the Arab tribes of northern Arabia” and to map the information (Goodman, 68). She produced what came to be known as the “Bell Report,” in which she informed the War Office that “Syria was pro-British, with a dislike of the growing French influence in the region. In the circumstances, Syria would be perfectly content to come under British jurisdiction” (Howell, 219). She also named and detailed the activities of the Arab chiefs in and around Baghdad. Her information was corroborated by British agents working on the ground, and the report quickly became central to guiding the British foreign presence in the Middle East. She was then assigned to Basra to work for the Chief Political Officer in Mesopotamia, Sir Percy Cox, where she wrote numerous intelligence reports that were produced in a “handy pocket-sized format” and used by new British officers being funneled through Basra as the fighting in the crumbling Ottoman Empire brought more troops to the Middle East (Bell 1918; Bell 1920; Winstone 1978, 247; Rich 2001, iv-v). After the war, Bell continued to influence policy in the newly formed Iraq, by being the new King Feisal’s trusted adviser as well as the director of the new Iraq Museum; she is still celebrated for her work there. *These men have been identified as Samuel Lathrop, Sylvanus Morley, Herbert Spinden and J. Mason. This entry was posted in Archives, articles, James Breasted, War, Women in Archaeology. Bookmark the permalink.